How goeth it? You may have noticed that I've been away for a bit. I've been taking a class on Ancient Egypt (and it's not in my native language) and every living extra second I've got, I plop down and read, watch lectures, look up weird words that I've never heard of in any language, and do horribly on impossible tests. It's great. You should try it for fun sometime. Anyway. 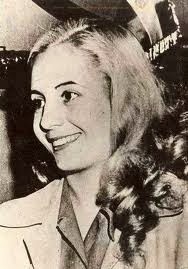 I also teach a class and in that class we came across the crazy interesting subject and person of Eva Peron. Recently I watched the movie called "The Mystery of Eva Peron" (El Misterio de Eva Perón) and I couldn't believe how much she seemed to parallel the life of the ancient wife of the Pharaoh Amenhotep IV (later named Akhenaten), Nefertiti. These ladies were off the hook, ya'll. So, let's go with the older one first. 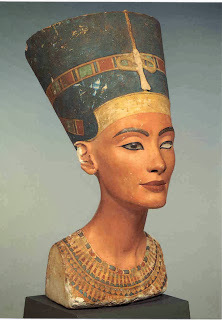 Fancy pants Nefertiti was this amazingly gorgeous main royal wife of Amenhotep IV. Amenhotep IV was a rebel pharaoh. As you know, the ancient Egyptians were polytheists and had piles of gods that they worshiped: several versions of the sun god, scarab beetle gods, fertility gods, gods for harvests, gods of the underworld, etc. You know the pictures - they've got beetle heads, cow heads on men, dog looking faces on man bodies, etc. Well, along comes Amenhotep IV. His name originally meant "Amun is pleased". Amun is one of their gods, of course. In the 5th year of his reign, he changed his name to Akhenaten. This name means "servant of Aten" (a different god). Well, this may not have been such a capital offense, but this dude decided that the only god that they should all be worshiping and serving was Aten. This may not seem like a radical idea to you, but this was seen as a drastic threat to every aspect of life (as in, these other gods are going to be so mad that you're ignoring them, all heck is going to break loose!). He built an entirely new city for his god, off where nobody was (they refer to it as "virgin ground"). And, since he was the pharaoh, everyone had to obey (since they also believed he was a god). So this is the intersection of the world at which Nefertiti was dropped in to forge her way. She was the chief wife of Akhenaten and they were very tight. She is in so many images with him and some you cannot see anything of her except her leg and feet and hand (she is so closely tied with him that they seem inseparable). She was his right-hand man (? um...well...woman), they were unified as one. He even went so far as to have this gigantic wall decoration done and it showed HER doing the worshiping procedures over in their new city. I don't have to tell you that this did not sit well with other males, for one. Who does she think she is? Taking a man's place? Oh no you didn't! (pouted lips, eyebrow up, snapping fingers like nobody's business and head waggin' all up and down the Nile, baby!) Yeah. They pretty much hated her. The priests of all of the gods led the way in hating her - they would be instantly out of a job if they got their way and only worshiped one god. Her influence on her husband was far more than theirs, and with that in place, so was her power. The royal couple had six children, all females. After her husband's death, she reigned (or so it is believed by some) as Neferneferuaten (her name change) for three years. Okay. Now they really hate her. She was a very powerful woman, either way - if you believe she did rule or if she didn't. She had the ear and the heart of the most powerful man in Egypt, an empire near its height at that time. When Queen Nefertiti died, the priests of the gods rejoiced. Then they took the step that they weren't afforded during her lifetime - they erased her and her husband from collective memory. Tutankhamen was the son of Akhenaten, but by one of his other wives (Kiya). I read a book (okay, the second half of the book) called The Search for Nefertiti by Dr. Joann Fletcher. She was on the team who found and identified what is now thought to be the mummified remains of Queen Nefertiti. When Dr. Fletcher was allowed the opportunity to examine the tomb, they found three bodies mummified within. After DNA testing, x-rays, and intense detailed study, they felt that they could, without a doubt, identify that one of those bodies was indeed Nefertiti. This came along with some disturbing evidence that her body had been purposely and violently defaced. If you're an ancient Egyptian, you'd believe in the afterlife. You'd believe that you'd need food and lots of things (like a boat, some furniture, etc.) to get you around in the afterlife. There was a strange physical connection that we would not often think of now (How are you going to use a physical boat? You're a spirit! That wasn't the way they thought...especially since those canopic jars are holding your organs and you've got a spread of food waiting to be gobbled up. And you thought digesting GMO's was difficult - try digesting without your stomach.). So, do you know what her enemies did to her? (Yes, this is pretty gross and weird.) They hacked her up. He took a sharp metal sword/dagger, uncovered her and stabbed her a few times. Her mouth was also busted up. Why would they have done this? Those 17 years were enough of monotheism for the Egyptians. They ran back to their previous beliefs and the priests (and presumably, some of the people) rejoiced. Back in power at last. Fast forward to the other side of the world and 3,000 years later. It's the early 1900's and we're in Argentina. Maria Eva Duarte was born into poverty. Her father and mother were not married to each other - her father had a wife and Eva's mother was one of his mistresses. 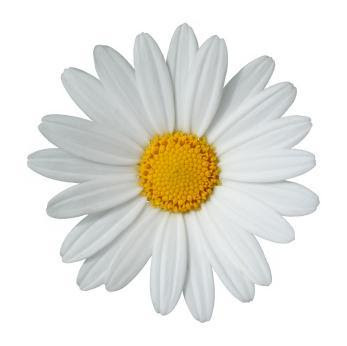 She grew up feeling shame for being an illegitimate child and grew in toughness through this difficult life. When she was nearing her coming of age, she set out and tried her hand at being an actress. She had the usual story of a starving artist - living anywhere from on the street, to a dingy hotel, all the while never having enough to get by. One day, she had the right contacts at the right time and became more popular and gained parts that would start paying. This was the time in her life when she met her husband, a powerful, much older man named Juan Peron, the dictator of Argentina. She could use his power for her means, and he could use her face for his schemes. Perfect match. (How romantic.) She was a beautiful, bleached blond bombshell actress with a passion for the poor. She would stand out and give speeches, imploring the listening people that they must show their love and devotion for Perón and oust any traitor who would vote against him. She delivered passionate, wild, poignant speeches where she nicknamed the poor "her shirtless ones". They flocked to her and she doled out her blessings. Her gifts caused her to grow in the hearts of the people, and this love brought her more power than her husband. They worshiped her. The nicknamed her "Evita" (little Eva, dear Eva). Within the heavily Catholic country, she became a saint. The people clamored for her to have her own power - to run alongside of her husband and accept vice-presidency, and although she would have had it, he would not. The men who surrounded them hated her. The rich despised her and her humble beginnings, her socialist machinations. She was a face plastered everywhere, an emblem of a battle cry for women and for the poor. She was diagnosed with uterine cancer. She lost immense amounts of weight. In her last days, she weighed less than 80 pounds. This small and beautiful frame was falling apart. She fought to continue to make appearances, standing up in open cars, parading around the country with her husband - staying awake for 20 hours at a time. Then came the weird stuff. A doctor from the United States was called upon to give her chemotherapy (this was 1952, 1953). Through "clumsiness" and "accidents", she was burned all over her skin with the drug. She grew weaker daily. 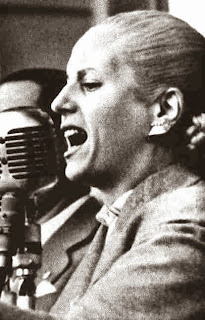 At only 33 years old, Evita died. The country went nuts in mourning. They decided to embalm her body (at the cost of something like $100,000). For weeks, people stood in mile long lines to wait to kiss her coffin and mark the sign of the cross in front of their fallen saint. After this time, it was going to take a full year to embalm her body properly, and to prevent political uprising, they had to hide it. Perón's military general overthrew him and everyone began ping-ponging for possession of Evita's corpse. Eventually, it was sent to Italy under a false name in the coffin. After much craziness (that I won't go into here) and after TWENTY-FOUR years, her body was brought back to Argentina and buried. When the body was brought back to be properly identified, the man in charge of examinations was quite horrified to see that her body had been mistreated. She had lacerations and damage to her face among other things that I will let you examine for yourself elsewhere online or otherwise (not super pervy, but just unpleasant and odd). Clearly the sickos have resurrected themselves after 3,000 years to take aim at yet another corpse that they couldn't overcome in life. Frankly, I say they killed her, and though I don't know all the sick means that they would have employed for such a task, my gut knows it and it is troubling. These two fought against a male-dominated society who hated them with passion, and while I don't support female usurpation, I am blatantly reminded that the struggle for power is steeped so deeply into the hearts of evil men and they will not stop at any means to regain power, erase opposition, and even destroy what most consider untouchable (that is, defamation of corpses among lists of other things). And at any rate, we can always remember that history will always find you out. Yes, history is written to suit those in current power, but the truth is beyond futile attempts at covering reality. I hope you don't mind the random comment, but I wanted to say how much I enjoyed reading this post. 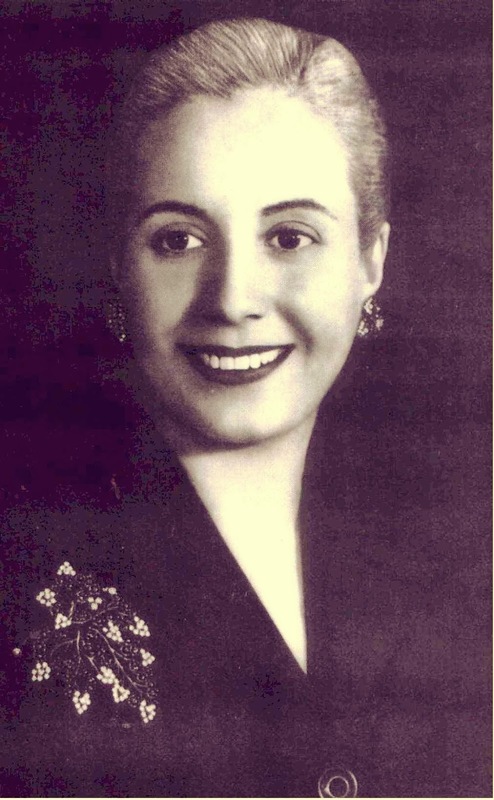 I'm currently writing a book about the legacy of Eva Perón, and I'm collecting stories from people as to why they're interested in her. I wondered if you'd like to contribute something? If you think you might be interested, I'd be happy to give you some more information, so just get in touch. My e-mail is theevitaproject@hotmail.co.uk and my Facebook page is www.facebook.com/TheEvitaProject. Should you get a dog? Pack up, time to live on Mars.